A Fight to Be | Ronald Bassman, Ph.D.
“My ascent from madness to my present state of clarity and self-acceptance was and is a journey whose responsibility always resided within me. However, as I try to describe and share with others what wisdom I acquired to aid them in their own work, I acknowledge one element that I do not understand or take credit for, something that is named or interpreted according to one’s unique beliefs and values as luck, fate, karma or God’s blessing. Once a twenty-two year old man, stripped naked, shackled in restraints and subjected to mind-numbing drugs and forty life-threatening insulin comas all in the name of treatment, Dr. Ronald Bassman painfully and slowly reconstructed his shattered life. Today a teacher, therapist, activist, and internationally sought after speaker, Dr. Bassman takes us inside his extraordinary journey of recovery, challenges the medical community’s reliance on pharmaceutical solutions as the only path to healing, and explodes the myths of diagnostic certainties and limitations. Drawing on his and others’ first-hand stories, he explores new compassionate paradigms of transformation and recovery. Riveting, horrifying, and ultimately uplifting, A Fight To Be is a story of courage, determination, resilience of the human spirit, and above all, hope and possibility. Dr Bassman’s unique insight from both sides of the locked door challenges readers to open their minds and their hearts, reexamine assumptions, discard limitations and embrace possibilities. A ground-breaking book, A Fight To Be speaks directly to individuals, families, students, professors and clinicians with a compelling message: we can and must do better. Internationally known advocate, psychiatric abuse survivor organizer, and clinical psychologist Ron Bassman discusses and reads from his new book, A Fight To Be. Ron was diagnosed “paranoid schizophrenic” and left in back wards as a “chronic case,” but has gone on to become a leader in the recovery movement and an inspiring teacher and therapist. 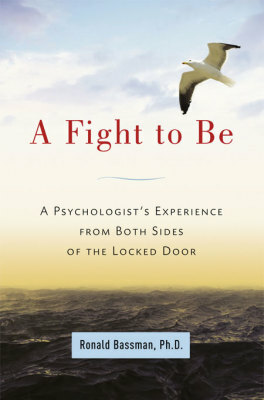 Guest Ron Bassman, a psychiatric survivor, discusses his new book A Fight to Be. From his unique position as a man who has experienced psychiatry from both sides of the locked door, Ron Bassman offers the reader an unflinching and heart-rending description of his own incarceration as a young man, and sheds light on the sorry state of today’s public mental health system. As his inner journey from passive mental patient to compassionate psychologist and activist demonstrates, the medical model of psychiatry does not support the growth and healing of those who experience extreme emotional distress. Rich, thoughtful, and beautifully written, A Fight To Be is one of those rare books that seamlessly weaves together the personal and the political to offer a new way out of an old dilemma. Dr. Bassman’s emotional problems, his two forced incarcerations, the treatments forced upon him and the difficulties placed in his way to resuming a normal life might well have killed him or made him a life-long cripple. But he recovered, and his account of his life and his treatment is a moving and accurate description of what we do to make recovery IMPOSSIBLE, while we believe we are doing it to help. Every mental health professional, administrator, or concerned political leader ought to read and learn from this book. Ron Bassman’s story – his descent into a psychiatric abyss and his ultimate triumph to live a purpose-filled and self-directed life – should be required reading for anyone who has ever been diagnosed with a mental illness, those who love them and those professionals who have the power to label and diagnose. A Fight To Be deconstructs the myth that a label of schizophrenia means a diminished capacity to create a meaningful life for oneself. As you open the pages of this book, be prepared to learn that there is more to treatment than pills, that there is always meaning in madness – if you dare to look and listen – but most of all be prepared to find hope for recovery. A very personal and precious gift from an oh so gifted writer. Ron Bassman has written a book about severe mental illnesses that works on so many levels and that speaks eloquently to so many kinds of people. Ron’s compelling life story of his recovery from schizophrenia is always educational, typically challenging and thought provoking, and often times inspirational. Mental health professionals, educators and their students, the general public, and people with mental illnesses and their families will find A Fight to Be a unique and riveting read. You will be glad you read this beautifully written book. In this thoughtful and thought-provoking book, Ron Bassman tells the story of his journey from a diagnosis of hopeless and chronic schizophrenia to being a psychologist, activist, and father. Bassman indelibly chronicles his suffering in institutional settings and challenges mental health professionals to broaden their understanding of serious emotional conditions and explore possibilities of recovery beyond medication and day treatment programs. He provides hope to people who have been diagnosed with psychiatric disabilities and creates a framework for recovery that is both radical and realistic. A Fight To Be is a compelling first-person account of schizophrenia, psychiatric treatment, and recovery. It makes us aware of our intolerance and lack of support for those who do not fit our definition of “normal.” Dr. Ron Bassman advocates for positive alternatives that promote everyone’s right to flourish. This book will be highly useful to those experiencing such alternative states of mind and their families, as well as mental health students and professionals. Ron Bassman’s remarkable A Fight To Be is among the very best writings by a psychiatric survivor I’ve ever read. This landmark work should be essential reading for anyone who has ever challenged, or even questioned, the ideology and practices of the “mental health” system. Bassman offers a new, enlightened way of understanding people in crisis (in psychiatric terms, people undergoing “psychotic episodes”) and humane, practical, freely chosen alternatives to involuntary psychiatric interventions. After finishing this book, a caring person will be hard pressed not to conclude that what is needed for the psychiatrically oppressed is an Emancipation Proclamation. Dr. Bassman explodes the myth of “progressive, incurable brain disorder” that is now the general view. We have trusted too long in the mechanical medical model that denies the strength and the spirit of ordinary human beings. I recommend this book to clinicians, family members, and the many people who have in some way been touched by mental illness. An insightful and exciting glimpse into psychology’s potential for those who have entered the mental health system. Ron Bassman is truly a pioneer whose courage and faith in himself will revolutionize treatment of an often overlooked segment of our society. Dr. Bassman’s unique trifecta of vantage points-a former mental patient, a clinical psychologist and an advocate extraordinaire-offers the reader a most informative and breathtakingly comprehensive view of emotional distress and the way our society deals with it. After reading this book, no one will be able to reduce madness and recovery to the simplistic (and dangerous) notions of biological psychiatry and mechanistic treatment. A hero of the empowerment movement has given us a heroic account of survival and inspiration for generations to come.